That pretty much sums up the day I turned 39. Nothing over the top. Kept today simple. Got some work in, made time to check out the River Safari, dinner at my favourite vegetarian place in Chinatown, caught The Lego Movie and wrapped the day with the latest episode of The Walking Dead. Pretty much all the things I enjoy squeezed into a day and I really couldn’t ask for more. Nothing like a birthday to remind you of the support system you have. When it comes to that department, I’m so very blessed with the team I’m a part of. I know I’m nowhere and no one without the love of my family and friends. If today is anything to go by, my 39th year looks like it’ll be a lot like most of my other years. There will be ups and also downs but more importantly, more dreams to be had. That’s how you keep it AWESOME. Over the Chinese New Year weekend, my dear friend , Claire and her family didn’t think twice to help a couple who needed it. In their own words, Claire shares how each of us in our own ways can change the world we live in. Yesterday evening while we were on our way for a CNY visit, we saw this old couple stuck by the side of Opera Estate along Siglap road. For those of you who know the area, the roads are very slopey and not at all conducive for pushing a wheelchair. We quickly stopped our car and Pann got out to help the uncle. The wheelchair was in a bad condition and was unable to be maneuvered properly. Eventually the tire gave way and Pann had to call a taxi to send the couple home. We could not stop thinking about them the whole night. Today, we spoke to Renn and Aira and we decided to use all our Ang Pow money to buy the old couple a new wheelchair. We knew the block they were staying at but had no idea which floor nor unit. We were very lucky to be able to locate the old auntie and eventually got to the uncle. And we realised they had no relatives keeping in touch with them in their one room flat. They were so happy and surprise to receive the present along with some Ang Pows. This got to be one of the best days knowing that the kids were very passionate about helping others because Chinese New Year is not about receiving Ang Pows but sharing with others. For me, I love the fact that a simple story about giving and sharing love made its way around. I love that it isn’t just depressing or hateful stories that run amok online. I love that I’m blessed enough to have friends who remind me that living is about sharing, giving and filling it with moments of love. I also love how the Year of the Horse is starting off in my world. Giddy up!! If you haven’t noticed, it’s the year of the Horse and I have officially over ate. I don’t think I’ll feel hungry again for a long long time and I truly can’t complain about it. 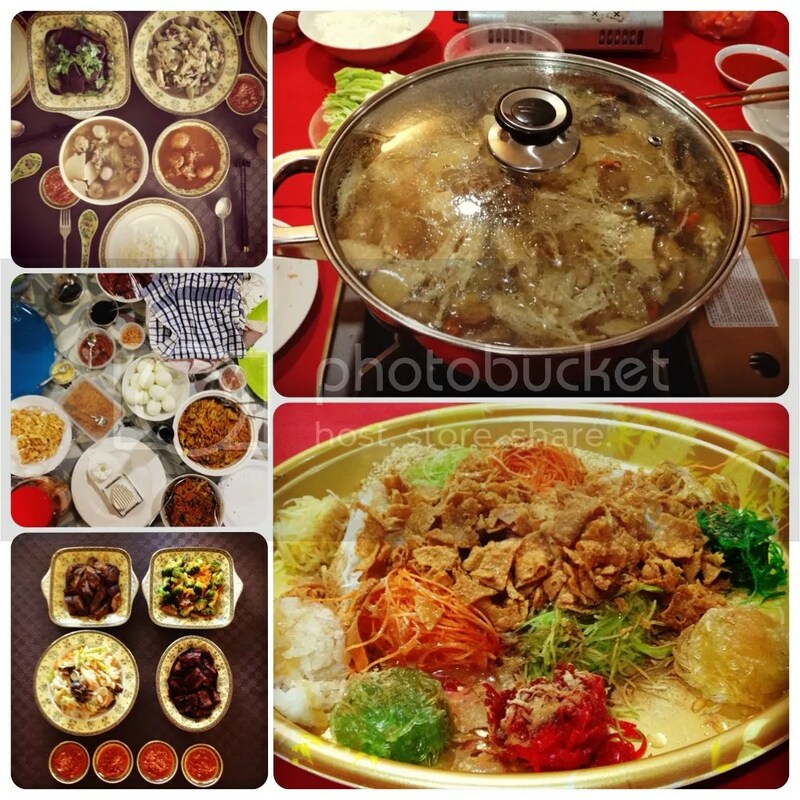 It started with the annual reunion dinner and the ubiquitous steamboat. With my Mummy in town, I had every craving met with all the traditional dishes my Grandma use to make but vegetarian!! How lucky am I? All I can say is that the year of the Horse is looking good for me 🙂 It’s off to a bountiful start. Depending on the sources you refer to, this year being the Wood Horse is suppose to good for the Wood Rabbits, which is what I am except for their health. We’ll see how healthy I am when I usher in the year of the Goat next year. Meanwhile, I’ll take all these advice with a pinch of salt, like I do every year. That’s because I’ve learnt, every year will have it’s ups and it’s own downs, typically a fair share of both and it’s things we can’t control. What I can control is how I react and deal with them. For now, let’s see how much control I have over the remaining traditional Chinese New Year yums that’s still in my house.